Nothing else quite says December to me. Whether it’s rainy days, sleet, snow, a fire in the fireplace and some peppermint bark stashed in a secret spot, perfect for discreet nibbling, or sharing if you’re feeling charitable. 😉 And it’s so easy! 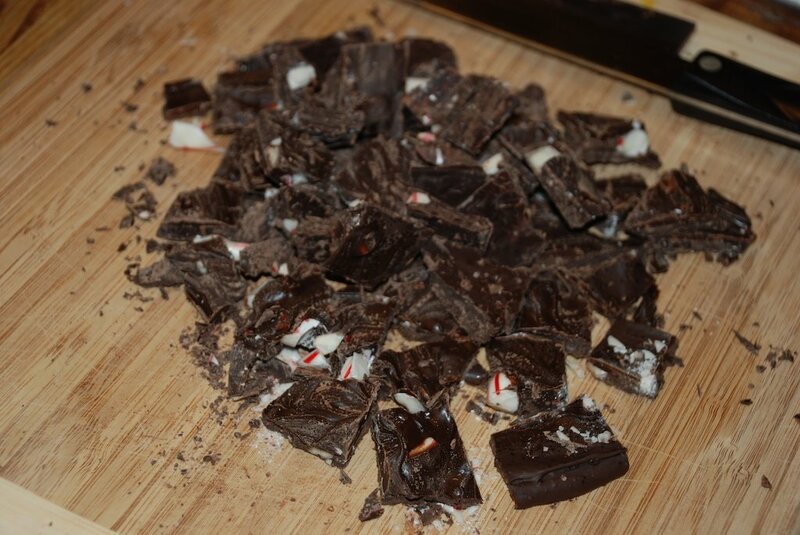 All you need is a little pent up wrath, some peppermint candy and chocolate chips. Makes enough for you, your family and some dearly loved friends. 3 cups chocolate chips (I used Hershey’s Dark Chocolate Chips with great success, but you can also use white or semi-sweet chocolate for this. A dozen candy canes or a two cups of peppermint candies. Channel your wrath into smashing the unwrapped peppermint candies to bits. You’ll want some dust and some chunks. You really want some chunks in this, so don’t feel like you need to completely destroy it all. Unless, of course, you’ve been saving up that wrath for awhile, or you want to make a bit of this that a child without molars can consume. For that, you want to make sure this is totally chunk free. I used a hammer from my husband’s workbench, a towel, a ziploc bag and a rubber cutting board on my counter top. Worked like a charm. Theoretically, you could just break up the candies with your fingers or run candy canes through your food processor, but where’s the fun in that? Spread the mixture on a cookie sheet you’ve covered with wax paper. Not too thin! 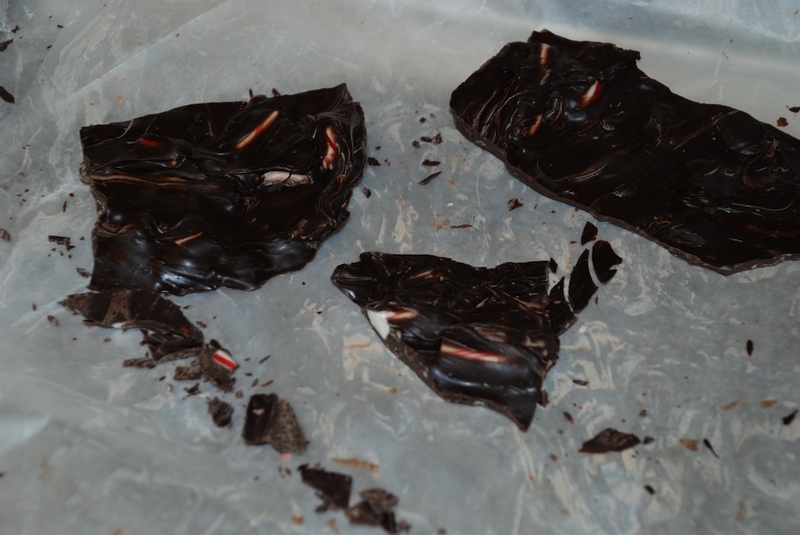 You shouldn’t see the wax paper through the chocolate. Stick it in the fridge or some other place it can cool and harden. When you’re satisfied, sneak a few bites just to be sure. Break up and store in a plastic bag or container. Keep it in your fridge or give it out as gifts. Or tell your husband you gave it all away, tiptoe downstairs after he goes to sleep and eat it all yourself. If, for some reason, it hasn’t all disappeared over the weekend, check back here on Tuesday for a chocolate peppermint bark cookie recipe.